Happily ever after is never as easy as the fairy tales make it out to be, and falling in love doesn't mean you have found your ending. Cheryl Ann wants her happily ever after, and she has a plan to get out of where she is, go to college and be somebody. Even the best laid plans don't go the way you want, and when Cheryl Ann's mother refuses to get on board with the dream, she must make some hard choices. When things are going well, an unexpected pregnancy forces her to make choices she never imagined, and those choices lead to twists in her path that she never saw coming. Baby Girl is the story of Cheryl Ann's life and triumphs. She has her pitfalls and bumps in the road, but she is determined to make something of herself, better than what she had growing up. Author Bette Lee Crosby weaves this story together in a manner that feels like a huge patchwork quilt. All the pieces and tears in Cheryl Ann's life come together to make something beautiful. 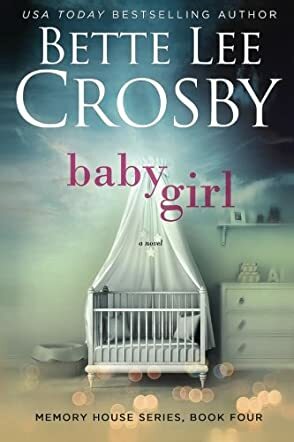 Baby Girl: Memory House Series, Book Four will have you crying along with Cheryl Ann as she makes hard choices, cheering as things go right, and wanting her to find that true love, once in a lifetime kind of love. Author Bette Lee Crosby treats each part of Cheryl Ann's story with respect and dignity, never making any choice or decision feel shameful, and building it into a heartfelt tale. There are social issues in this book, yet the author deals with them in Cheryl's mindset and they come across as genuine. Even though this is a story about Cheryl Ann, from her teens on up through life, I feel this book is a great read for all ages, including teenagers.